Founded in 1968 by John Tippmann, Sr., Tippmann Group has grown exponentially in it’s first 50 years of business. 50 Years of Cold Storage Excellence tells the story of a growing, family-owned company with a strong foundation and an even brighter future. 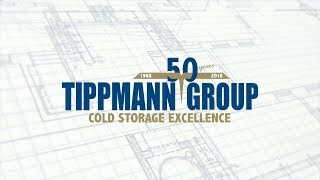 Throughout our first 50 years of business, Tippmann Group has built more than 17 million square feet of temperature controlled warehousing and processing facilities, while owning more than 100 million cubic feet of cold storage warehouse space at our Interstate Warehousing facilities throughout the United States. Thank you to our customers, business partners and employees who have helped make these first 50 years possible. Here’s to another 50 years of impacting future generations in the cold storage and construction industries! 6th largest public refrigerated warehouse company with more than 100 million cubic feet of cold storage space in the United States. Design/build company specializing in construction of temperature controlled food plant and cold storage warehouse facilities. Property management company owning office and industrial space in Indiana, including the Historic Lincoln Tower in downtown Fort Wayne. Tippmann Group’s QFR Zone® (Quick Freeze Racking Zone) has revolutionized the blast freezing industry. Using the latest QFR Zone® technology, Tippmann Group is able to improve air flow around palletized products to influence freeze time. This gives us the ability to provide our customers with a more energy and labor efficient solution for freezing their product quickly, while saving valuable time and money. Our QTR Zone® (Quick Thaw Racking Zone) utilizes that same technology to thaw your frozen product quickly. Contact us today to find out more about these revolutionary freezing and thawing systems.